Beaupré (QC), Canada – A jewel of the Côte-de-Beaupré region northeast of Québec City celebrates a half century of operation this season. 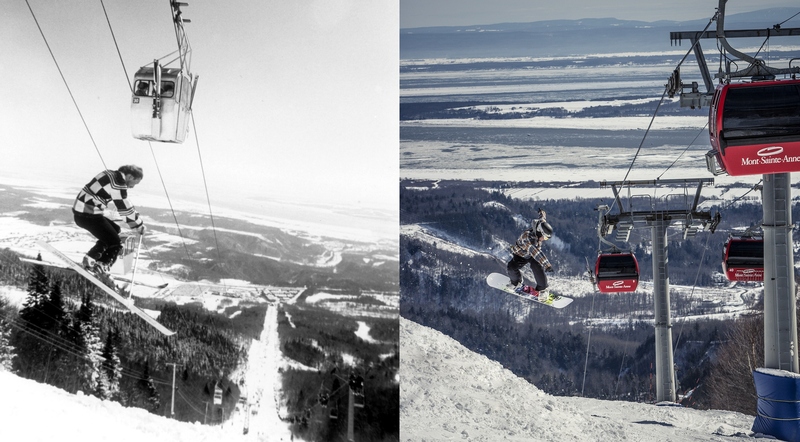 Mont-Sainte-Anne, well known to skiers in Québec and across Canada, will host festivities this winter to honor its 50th anniversary. Mont-Sainte-Anne first opened on January 16, 1966 with 10 trails and four lifts, including the first gondola in eastern Canada. On that day in 2016, the mountain will throw a huge party for the occasion complete with themed activities, prizes from Helly Hansen for those lucky enough to ride in two special gold gondola cabins, and 50% off lift tickets. Special breakfast and lunch meals will be available, the historic Sidney Dawes Slalom Race will return, and an ice sculpture contest will showcase amateur carvers. After night skiing is over, a fireworks display will cap the day’s festivities. The full schedule is available online. Rossignol has built a special 50th anniversary ski in honor of the occasion. Only 50 pairs of this specially branded version of the Rossignol Pursuit 700 ski have been produced, and are now available for sale mounted with Rossignol Axial 3 120 bindings. A giant mural painted by the 125 students of “Collège des Hauts Sommets” will be soon be unveiled, marking the 50th anniversary of the mountain and their shared values with it. And Mont-Sainte-Anne would be nothing without its employees, 20 percent of whom have been working at the mountain for more than 25 years. One has even been there since the very beginning in 1966!